Horror themed dubstep DJ Figure will be headlining with his signature of spooky sounds. Figure is a rising name in the bass community with his live performance skills being recognized as some of the best in the industry. He began his career creating Halloween soundtracks for Universal Studios and since then has ventured off to release 8 music volumes in his own series which is a mixture of drumstep and dubstep. 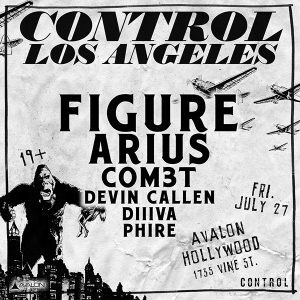 Figure is sure to frighten and entertain the crowd with his dark tones and deep bass, weird sounds you can’t miss.